Are armored fighting vehicles a Godsend - or the work of Satan himself? In the years following the First World War, men looked back upon the grim carnage with a mixture of horror and hope. Horror, of machine warfare where valor and courage meant nothing in the face of industrial warfare. Hope, that these very same machines if perfected and produced in large numbers, might make warfare quicker, more decisive, with less overall bloodshed, or perhaps deter it altogether. Few realized they faced a devil's choice, and were damned if they did, and damned if they didn't. But most nations had enough sense to banish conflict to the fringe of their empires, whose inhabitants would not be missed if there were suddenly less of them. 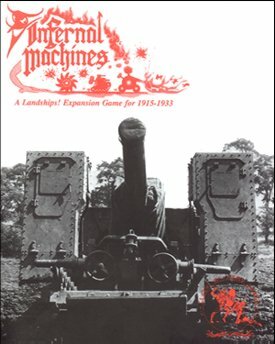 Infernal Machines is the first expansion kit for Clash of Arms Landships! game. You must own Landships! to play Infernal Machines. Designed by Perry Moore, Infernal Machines retells the story of man versus machine in 20 new scenarios. These range from the technological fantasies of the Great War through the gritty Russian Civil War, to the deserts of Morocco and the high altitude Chaco. With two new double-sided map panels and 280 counters, Infernal Machines is fully compatible with Landships! and provides new vehicle and terrain rules to improve the basic game. The infantryman's war is not neglected either. The first mortars, SMGs, body armor, and light machine guns all make their deadly appearance. For artillery (the real killer in action), Infernal Machines explores the ticklish intricacies of single creeping and double creeping barrage lines, interdiction fire, counterbattery and suppression fire. It is said that as they moved up into the front lines, soldiers would often sing a droll little tune, "The Bells of hell go ting-a-ling-a-ling For you but not for me." Dare to find out if it's true with Infernal Machines!